A Macro executes a sequence of Macro Actions in order. There are many actions to choose from, and these are detailed below. Some simple actions, such as Sleep Computer, require no other information and simply do their job, while other more complex actions, such as Select Menu Item, require you to specify more information, such as a target application or menu name. Some actions are simple and do not require any configurion (eg Shut Down Computer). Other actions require you to specify parameters to the action, such as which window to move and by how much. You do this by editing the values for the action. In Keyboard Maestro, there are two kinds of processed fields in actions, text token fields and numeric calculation fields. Most text fields are text token fields. Most numeric fields are calculation fields. Text token fields typically (but not always) have an Insert Token pull down menu, and are always somewhat long. They are designed to allow you to enter a defined text item, rather than a numeric value. In these fields you use text tokens, which are marked with percents, like %CurrentClipboard% or %Variable%My Variable%. You can insert a text token from the Insert Token popup menu, or by choosing Insert Token from the Edit menu, see the Text Tokens section. Numeric calculation fields are usually small to start off with (assuming they contain only a number), and usually have a stepper (double arrows) next to them. They are designed to allow you to enter a specific numeric value. In these fields, you can type a raw calculation. As soon as you type anything other than a digit, they expand to a larger size to allow for a calculation. Calculation fields never use percent tokens, but they can include variables or functions. You can insert a function or variable by choosing Insert Function from the Edit menu, see the Calculations section. If desired, you can include a calculation in a text token field by using a %Calculate% token like %Calculate%1+2%. You can never use text tokens in a calculation field. switches back to the previous application you were in. switches to the next application (alphabetically). launches if necessary and brings the specified application to the front, optionally reopening the initial windows. If the application is already at the front, the action can optionally switch out, hide or quit it, allowing you to toggle an application. Very useful for utilities like PCalc. brings all the windows of the current application to the front. quits all foreground applications, optionally honoring the excluded application list. quits all foreground applications except the current one, optionally honoring the excluded application list. quits the specified application, optionally force quitting or relaunching. hides all foreground applications, optionally honoring the excluded application list. hides all foreground applications except the current one, optionally honoring the excluded application list. simulate Command-X, Command-C, or Command-V keystrokes to Cut, Copy or Paste to/from the system clipboard. set the system clipboard to a previously copied item. set the system clipboard to plain or styled text. Text Tokens are provided to include such things as the time or date. set the system clipboard to the value of a variable. delete the current clipboard, replacing it with the previously copied value from the clipboard history. This can be used to restore the system clipboard after another action sets the clipboard temporarily. delete a past system clipboard. This can be used to restore the system clipboard after another action sets the clipboard temporarily. cut, copy or paste to/from the specified Named Clipboard. copy the system or a Named Clipboard to the system or another Named Clipboard. apply a style (like font or size or underline) to (a section of) the system or a Named Clipboard. apply any saved BBEdit Text Factory to the system or a Named Clipboard. apply one of a set of Filters to the system or a Named Clipboard. search and replace the system or a Named Clipboard, optionally using regular expressions, and allowing Text Tokens. The replacement can also include $1 tokens for regular expression replacements. search the system or a Named Clipboard using regular expressions, and capturing the results. extract a substring of the system or a Named Clipboard. display the system or a Named Clipboard in a window. You can control the flow of a macro execution using a variety of actions, from a simple Pause for a number of seconds, through a complex nesting of If/Then/Else and looping. pause for a number (which may be a calculation) of seconds. pause until conditions are met. execute a list of actions until conditions are met. while conditions are met, execute a list of actions. repeat a list of actions a number (which may be a calculation) of times. if conditions are met, execute a list of actions, otherwise execute another list. loop over a collection of values. execute another macro (like a subroutine). Cancel all macros that Keyboard Maestro Engine is currently executing. Cancel this macro (including any macro that executed this macro). Cancel just this macro, continue executing a macro that executed this macro. Cancel execution of the current loop, and continue execution after the loop. Wait and lock a semaphore to ensure exclusive access/execution. Unlock a semaphore (happens automatically if macro terminates). You will often need to use the Pause action to slow down replaying of an action sequence to allow the system time to catch up—especially after you have changed applications or if you want to use a mouse click. Any of the following are true – at least one condition must be true. All of the following are true – every condition must be true. None of the following are true – no condition is true. Not all of the following are true – at least one condition must be false. If there are no conditions in the set at all, the action will not execute anything except the Until action which will execute the actions once. Neither side of the If Then Else will execute. There is over a dozen different kinds of conditions, from testing what the current application is or examining variables or the clipboard, to checking your network location or testing a pixel on your screen, see the Conditions section. A number range (eg 1 to 10). The files in a directory (optionally recursively). The files or folders selected in the Finder. The lines in a clipboard, Named Clipboard, variable or file. The substrings in a clipboard, Named Clipboard, variable or file. The control flow actions include a nested list of their own actions to execute, and that nested list can include further control flow actions—go wild! But keep in mind, there may be a time when a shell script or AppleScript is a more useful way of describing your solution. See also the Conditions, Variables and Calculations sections. 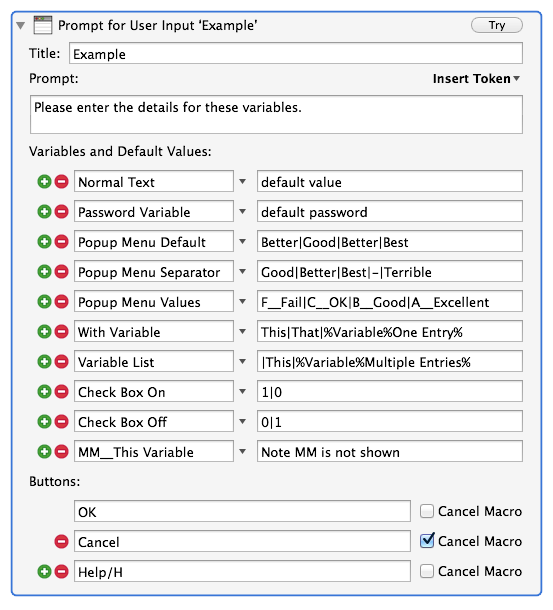 Keyboard Maestro includes a built-in Macro Debugger which allows you to observe and control the progress of a macro in action. As well as using the Macro Debugger normally, you can use any of these actions, triggered by any method you like, to control the debugger. start or finish debugger, or toggle the debugger on or off. control whether new macros start paused (while debugging). pause the specified macros in the debugger. step other currently executing macros. Note that regardless of whether a macro would otherwise be paused, these actions will always execute. So, for example, even if you have New Macros Paused, macros that start with these debugger actions will still execute the action. See also the Macro Debugger section. send (or create) an email message, complete with optional attachment. set the flags on the currently selected mail message. Note that the currently selected mail message is not necessarily the front window, it may be a message selected in the viewer behind the front window, especially if the front window is a reply or new message. execute a specified AppleScript, either from a file or text. For example, say "hello". execute a specified shell script, either from a file or text. For example, pbpaste | pbcopy. execute a specified Automator Workflow. execute a specified macro. This allows you to create subroutines of instructions. The current macro waits until the submacro finishes, or optionally execute asynchronously while the macro continues on. Displayed briefly in a Notification Center. Saved in to a variable. Saved in to the system or a Named Clipboard. Asynchronously ignored - the action runs while the macro continues on. For example, you could have a shell script date display briefly in the Notification Center every hour, or use a hot key to type the results directly into your text editor. These powerful actions allow you to add any new facilities we have not provided for, stringing them together with other actions as desired. You can also use the clipboard by piping from pbpaste and to pbcopy. Shell scripts are executed in the background and can access variables by using environment variables, see the Variables section. set v to do shell script "echo $KMVAR_Variable"
It is a short step from executing a script action to writing some Plug In Actions. Move (or rename) a file or folder. Copy a file or folder. Duplicate a file or folder. Trash a file or folder. Delete a file or directory (recursively). This is potentially very dangerous. Read a file to a variable or to the system or a Named Clipboard (can be an image or styled text). Write to a file from a variable or the system or a Named Clipboard (can be an image or styled text). Append text to a file from a variable or the system or a Named Clipboard. Get or Set file attributes. The source path must be an absolute path (or a home relative ~ path). The destination path must either be a simple single path component (not ~ or /) or an absolute path. If it is a simple path component, then it is relative to the parent directory of the source path. This is particularly useful in the Move or Rename action, as you can, for example, rename from ~/Folder/Old Name to New Name. You can read or write files in a variety of formats, including PNG, TIFF, JPEG, as well as HTML, Web Archive, Word Document and more. owner name and ID (r/o). whether the extension is hidden. HFS creator and type codes. Mavericks tags (set, add, remove or toggle). parent path, file name, base name, and extension (r/o). New window with optional URL. New tab with optional URL. Wait for the current tab to finish loading. Set the URL or title. Focus or select a field. Set a variable to the contents of a field. Set a field, checkbox or radio button. Submit or reset a form. There are also a number of functions to get various values from the web browser, including the tab count, tab index, and whether the browser has currently finished loading. Note that complex web sites often report that they have finished loading and then start loading again, which is why the action to wait for the browser to finish allows you to specifiy a required minimum time. See also the Text Tokens and Calculations sections. Screen Capture a window, screen or all screens. Find Image on Screen optionally highlighting it. Read an image from a file. Create New Image with size and color. Flip Image horizontally or vertically. Rotate Image by 90°, 180°, 270° or an arbitrary angle. Resize Image, resize canvas, add or remove margins or crop. Composite images or styled text onto an Image. Draw a Shape (line, rectangle or oval) onto an Image. Trim transparent areas from the edge of the image. Display an image in a window. Get Image Size into a variable. Image actions typically act on an image in the system or a Named Clipboard. You can read or write images files using the File actions. resize, move, center, bring to front, close, zoom, or minimize a specified window in a specified application. move, click or move and click the mouse using any mouse button, and optionally dragging. You can specify modifiers such as the shift key, as well as the position, relative to any corner of the front window, the main screen, or the current mouse location, or a found image on the screen. select or show a specified menu item in the front or a specified application. press a named button in the front window. simulate pressing a specified keystroke. simulate scrolling the mouse wheel up or down, left or right. use a variable to move the mouse, or to adjust a window or the front application, or the system volume. The various size and location fields can be Calculations. The Manipulate Window action includes defaults for positioning a window in various columns or corners of a screen. This is a useful way to see some examples of calculations you can use. The Move or Click Mouse has lots of options, including single, double or triple clicking, and where the click is relative to. If you record a mouse click, you can (for a short while) adjust the corner that the click is relative to and the values will adjust accordingly. You can also perform a click and drag with this action. The Select Menu Item action lets you choose from all currently running applications and their menus, which helps ensure you have correctly specified the menu. If you leave the menu item blank, Keyboard Maestro will show you the menu and let you then select it manually. The Select Menu and Press Button actions allow you to specify multiple options separated by a vertical bar (eg Show|Hide) to allow for toggling menus. They will also ignore the difference between three dots (...) and an ellipsis so you do not have to worry which one the menu uses. Alternatively, you can start the name with an ^ and use a regular expression to match the menu or button name. Also, Select Menu will translate the word "APPLICATION" (all capitals) into the current application name, allowing menu selections like APPLICATION -> About APPLICATION. The Select Menu and Press Button actions will, by default, abort the macro if the action is not successful (for example if the button or menu cannot be found or is disabled). The action can be configured to allow the macro to continue if the menu or button is not essential (such as “Mark As Read” which might be disabled if the item is already marked as read). Increase, decrease or set the iTunes volume. Increase, decrease or set the rating of the current track. record a temporary macro for immediate playback. type the name of a macro to trigger. enable, disable or toggle a Macro or Macro Group. activate a Macro Group for one action or toggle activation. show a Macro Group as a palette for one action or toggle visibility. cancel one, other, or all macros. does nothing, just allows you to comment a macro. shows or hides the global macro palette. 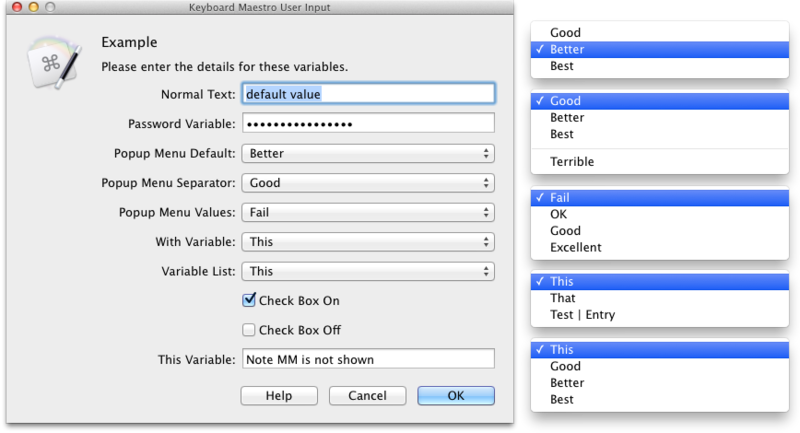 Shows the Keyboard Maestro status menu. Trigger Macro by Name allows you to trigger any active macro by name. By default, Keyboard Maestro creates a macro triggered by Command-Control-Option-T or the status menu which triggers a macro by name. Recording allows Keyboard Maestro to watch you as you perform a task and create the actions to produce a similar result. Record Quick Macro is a variant of this that you can activate at any time without launching Keyboard Maestro. You trigger the recording, and then perform a series of actions, and then turn off recording. Then press the associated hot key to replay the recording. By default, Keyboard Maestro creates a macro triggered by Control-F1 which executes the Record Quick Macro action with a hot key of Option-F1. So for example, if you press Control-F1 to start quick recording, type “hello” and then press Control-F1 again to finish recording, then Keyboard Maestro will type “hello” each time you press Option-F1. Because you cannot see or edit the recorded actions, it is best to keep them very simple. A good rule of thumb would be not to touch the mouse, just use the keyboard. For example, say you wanted to quote a dozen different words in a paragraph, you could click in the middle of the first word, press Control-F1 to start quick recording, type Option-Left Arrow, quote ("), Option-Right Arrow, quote ("), and then Control-F1 again to finish recording. Now click in the middle of each remaining word and press Option-F1. The Set Macro or Group Enable action allows you to enable, disable or toggle the enable of a macro group or macro. The Keyboard Maestro editor does not need to be running, but it will see the enable state when it is next launched (or immediately if it is already running). If you hide the global macro palette, it will remain hidden until shown. You can also hide the global macro palette by clicking the close icon, so you may wish to include a global macro, perhaps with a status bar trigger, which uses the Show Macro Palette to redisplay it. sends a MIDI Note On message, specifying the note, velocity and channel. sends a MIDI Note Off message, specifying the note, velocity (usually 0) and channel. sends a MIDI Control Change message, specifying the control, value and channel. The MIDI messages come from a device named “Keyboard Maestro” which will be created as soon as you add any MIDI action. Notification:displays a message in the Notification Center. display a message via Growl (or in a popup HUD window if Growl is not installed). display text (which may contain Text Tokens). display an alert (which may contain Text Tokens). display a dialog requesting information, see the Prompt For User Input Action section. play a standard system beep. play a sound, optionally through a specific output device. speak text (which may contain Text Tokens) in any desired voice or speed. log a message to the Engine.log file. highlight a location on the screen. opens a specified file or folder. Don’t underestimate the power of this command as you can open bookmarks or other action documents to perform a lot of customized actions. opens the files or folders that are currently selected in the Finder. open a URL with the appropriate helper. opens a specified System Preference Pane. Files, folders, the Finder selection and URLs can all open either in their default applications, or a specific application. So you could, for example, create a macro that opens the Finder selection in BBEdit. step the current movie forward one frame. step the current movie backward one frame. Increase, decrease or set the QuickTime Player volume. Keyboard Maestro includes several powerful switchers, including Application Launcher, Application Switcher, Window Switcher, and Copy, Cut and Paste Clipboard Switchers and Clipboard History Switcher. activates the Application Launcher (Command-Control-Tab). activates the Application Switcher (Command-Tab). copies the current selection to a named clipboard you select (Command-Shift-C). cuts the current selection to a named clipboard you select (Command-Shift-X). pastes a named clipboard you select into the current system clipboard and current selection (Command-Shift-V). pastes a previous system clipboard you select from the clipboard history into the current system clipboard and current selection (Command-Control-Shift-V). activates the Window Switcher (Control-Tab). You can create your own macros using these actions or adjust their triggers within the Switcher Group. By default, Keyboard Maestro overrides Command-Tab and the system application switcher. If you wish to use the default system switcher with Command-Tab, you can do so by disabling Keyboard Maestro’s macro or by changing its hot key trigger. puts your Mac to sleep. Fast User Switch to a specific user designated in the macro. sets the global "Find" pasteboard, typically equivalent to selecting text and choosing Use Selection To Find. The Find Pasteboard is used in most applications. Opens the CD tray if it is closed, or closes it if open (especially useful for keyboards that do not have an eject key). Mutes the sound if sound is currently on, unmutes the sound is already muted. Increases or decreases the sound volume. Sets the sound volume to a specific amount (can be a calculation). Increases or decreases the screen brightness. Starts or stops the system screen saver. sleeps or wakes the monitor. Some of these actions require particular hardware support and so may not work on all Macs. Most of these actions are covered in their respective sections (eg Set Clipboard to Text is covered in the Clipboard Actions section). typing the plain text as a sequence of keystrokes. setting the system clipboard to plain text and pasting. setting the system clipboard to styled text and pasting. For inserting text by typing, the text may include non-ASCII characters as long as they can be typed on the keyboard with one or two keystrokes. The Display Text action allows you to display the resulting text in a floating window or Notification Center. Tokens are provided to include variables, calculations, the time or date, and a large variety of other system information. The Insert Text action can be very useful to insert standard text templates, such as your signature, address, copyright or other boilerplate text, and so on. If you ever get email from Peter, you will probably notice that many of his emails end with “Thanks for your support, Peter.” – with the amount of email he deals with, you don’t think he types that in every time, do you? *  Created by %UserName% on %ICUDateTime%EEE d MMM yyyy%. *  Copyright (c) %ICUDateTime%yyyy% Stairways Software. All rights reserved. There are three ways to type text in Keyboard Maestro: Insert Text by Typing, Insert Text by Pasting, and Type Keystroke. A common question is when should you use each? The Type Keystroke action lets you type a single keystroke, pretty much any kind of keystroke you can type on the keyboard. The Insert Text by Pasting action sets the clipboard to the (optionally styled) text and then types a Command-V keystroke. The Type Keystroke action is just like typing yourself, so you can type any keystroke and any number of them, but it can be tedious to create a sequence of keystrokes in a macro. The Insert Text by Typing action is also just like typing yourself, similarly permitting characters like tab/return and maintaining the current style in the program into which you are typing, but it is slow for large amounts of text and can't type exotic characters like Emoji. The Insert Text by Pasting action is fast for large text and can include any kind of characters, as well as styles like bold and italic, but it overwrites your clipboard and its handling of styles may occasionally not conform to your expectation. The keystroke includes Command or Control (and sometimes Option) keystrokes. The text contains returns or tabs which you don't want to perform actions like moving to the next field. See also the Text Tokens section. set a variable to text. Text Tokens are provided to include such things as the value of other variables or the time or date. set a variable to the result of a calculation with numeric formatting, see the Calculations section. set a variable to a password value from the Keychain. the reverse, sets a password in the keychain to a value. apply one of a set of filters to a variable, see the Filters section. search and replace the value of a variable, optionally using regular expressions, and allowing Text Tokens. The replacement can also include $1 tokens for regular expression replacements. search a variable using regular expressions, and capturing the results. extract a substring of a variable. Use a variable to set a variety of system values like mouse location or front window. See below. display a dialog asking for a variety of user input, see the Prompt For User Input Action section. Set the front window position, size or frame. Set the front window by name. Set the front application by name. Which will result in the mouse being placed in the middle of the upper left corner of the front window. Search Variable will use a regular expression to pull apart a variable, allowing you to extract the various parts. It displays the results live in the editor, allowing you to construct complex regular expressions more easily. See also the Variables, Text Tokens and Calculations sections. Prompt For User Input will allow you to ask for user input, storing any results in variables as designed. If the variable is a password variable (ie, its name starts or ends with “Password” or “PW”), it will be displayed in a password field. If the default value you specify consists of choices separated by a bar (|), then a popup menu will be used (the first value will be the default value, and can be repeated later if a different location is desired). For example “Better|Good|Better|Best” would result in a popup menu with Good, Better, and Best, with Better pre-selected. If a component of a popup menu item starts with a prefix followed by two underscores, then the prefix will be used as the variable value, while the latter part will be displayed in the menu. For example, “B__Good|F__Fail|C__OK|B__Good|A__Excellent”. If the field starts with a bar (|), then token expansion happens first, followed by separating by bar (|) - this allows you to have a variable list of entries, for example, “|This|%Variable%Multiple Entries%”. Otherwise, the entry is separated by bar first, and then token expansion is applied to each field, so that fields may contain bars, for example, “This|That|%Variable%One Entry%”. If the popup menu would contain only "0" and "1", then a checkbox is used (so for example, “0|1" or "1|0", depending on the desired default). If the variable name starts with a prefix followed by two underscores, then the label will show only the latter part of the variable name (for example, MyMacro__Text Message will display a label of Text Message). You can include one or more buttons, which may optionally cancel the macro. You can also include /«letter» to configure command keys for the buttons (/. means escape, / by itself means the default button) (for example, “Help/H”. If there are no text fields in the dialog, the command key is not needed and the letter by itself will complete the dialog. The name of the button pressed will be stored in the Result Button variable. You can open a URL in your default browser or a specified alternative and you can have Keyboard Maestro query you for a search term and then search a specified web site (by default Google).